First they gave us Bamba. Then they gifted us with boxed mix falafel, marinated chicken shwarma, and zhug. 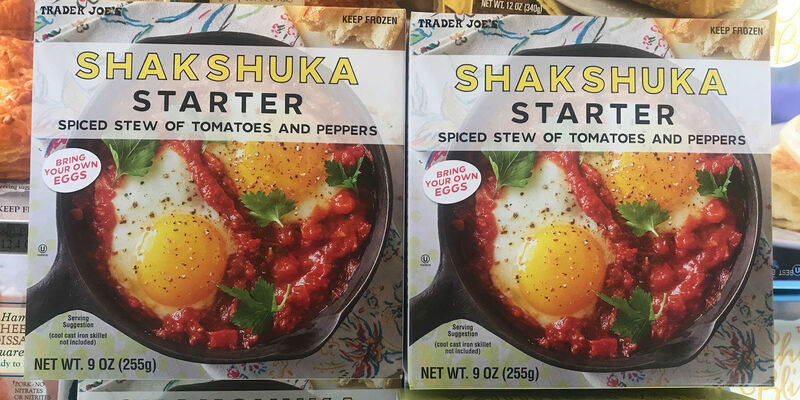 And now, Trader Joe’s is selling another popular Israeli staple — shakshuka. Walk the aisles of your local Trader Joe’s, past the hummus and tahini, and you’ll find their new shakshuka starter kit in the frozen aisle. For those who haven’t been scrolling Instagram religiously lately and need a primer: shakshuka is a vegetarian dish that originated in North Africa, specifically Morocco and Tunisia, which was brought over to Israel by Jewish immigrants from the region. Similar to eggs in purgatory, it’s a spiced, sometimes spicy, tomato and pepper stew cooked with eggs until they are just runny. It’s very common to find in Israel, especially for breakfast or brunch. And over the past few years, it has gained great popularity in the U.S. as well. Do we have Israeli actress Gal Gadot to thank for popularizing her secret diet? We’d like to think so. Naturally, as the tomato stew and egg dish becomes trendier by the day, restaurants are prone to hiking up the price for shakshuka. But, thanks to Trader Joe’s, you can get your scrumptious shakshuka fix at home for half the price. A 10-minute cooking time, Trader Joe’s Shakshuka Starter includes a mildly spicy base of tomatoes, bell peppers, garlic, and spices, so all you have to do is add the eggs (if you thought the frozen starter kit comes with eggs included, well, ew). Brunch, dinner, or brinner at home just got a heck of a lot easier thanks to Trader Joe’s. We haven’t tried their version yet, but here’s a super simple, scrumptious shakshuka recipe you can make to compare and contrast. From hummus to homemade pita, these are the foods you should enjoy this week.